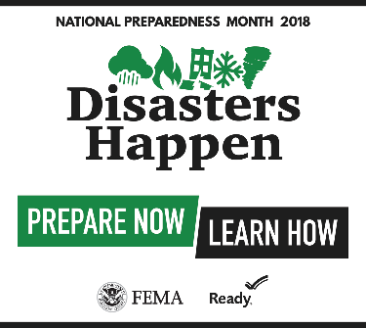 The Department for Public Health (DPH), within the Cabinet for Health and Family Services (CHFS), has launched First 72 On You information campaign during the month of September – National Preparedness Month (NPM), to increase emergency preparedness efforts for Kentuckians and their families. This week’s spotlight is on preparing older adults for disasters and emergencies. Older adults may be more vulnerable than younger adults during a disaster because they are more likely to have impaired physical mobility, decreased hearing and vision, chronic health conditions or social and economic limitations that may interfere with their ability to prepare for and respond to disasters. Maintain a supply of personal, health and home supplies, including a two-week supply of prescription medications, enough ready-to-eat food and water to last at least three days, first aid supplies, matches, spare batteries and a waterproof container for essential documents. Be sure to rotate the stock of items in your kit so they have not exceeded their expiration date. Individuals with mobility issues should plan on how to evacuate or discuss with care providers. If you use a motorized wheelchair, have a manual wheelchair as a backup. Those blind or visually impaired should keep an extra cane by the bed and attach a whistle to it. Be cautious when moving, as paths may have become obstructed. Also have a predesignated person and a plan in place in case evacuation becomes necessary because many blind individuals depend on public transportation that may not be operating during an emergency. Deaf/hard of hearing individuals should keep extra batteries for hearing aids with emergency supplies. Store hearing aids in a container attached to a nightstand or bedpost so they can be located quickly after a disaster. If your relative receives assistance from a home healthcare agency, find out how they respond to an emergency. Designate backup or alternative providers that you can contact in an emergency. Individuals with disabilities should contact their local fire department and/or police station now to inform them that they have a disability so that this information could be kept by the agency in case of a disaster. Throughout September, DPH has been spotlighting preparedness topics to include overall preparedness for families and older adults. Preparedness for pets will be spotlighted during the week of Sept. 24-28. Additional information about the campaign will be posted on the CHFS Facebook page: http://www.facebook.com/kychfs where Kentuckians are encouraged to like and share posts among their networks of friends. For more information about preparing for and responding to emergencies visit http://ready.gov/seniors.